The ad will show on your profile ! Find this layout and more on my website or on my myspace! I love this, and I love Conor Oberst. It's going up now :] great job! This is awesome; Cassadaga is a great CD. And I love the colors you used for this. 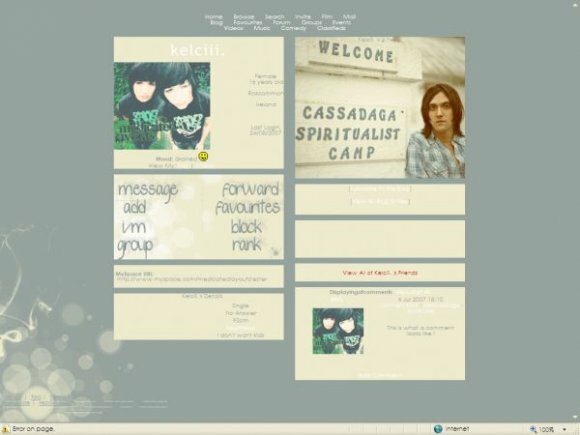 I'm more of a DIV overlay girl myself for Myspace layouts, but if this was DIV, I would change my layout immediately. Really like the layout and colors although the white writing is very hard to read when small font but other than that, very nice! yeah, i don't know who this is, but i really like this layout, especially the colors and the contact table. How come the good layouts are always of people or things i've never heard of? i don't know who this is, but i love your choice of colors.